Coconut oil holds key to the gorgeous skin, strong hair and healthy nails. Scientists now believe what our grandmas always knew, that this oil is a beauty elixir. The humble coconut oil, which was ubiquitous in Indian households and used as a multi-purpose beauty hack, is staging an impressive comeback. In between, it did earn a bit of a dubious reputation as many western mainstream brands scoffed at the concept of applying oil to the face. The traditional ritual of head massage was questioned. But with the green wave engulfing the beauty industry, oils are fast emerging as the new heroes. Until recently, coconut oil was considered highly saturated and, therefore, an unhealthy fat. But now coconut oil is allowed in most of the diets and is on its way to replacing olive oil as one of the healthiest oils. 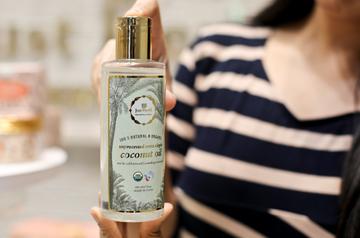 Labeled as the magical tropical oil, it is worth every bit the hype that surrounds it. Its benefits have been documented in Ayurvedic texts since centuries. Ayurveda refers to coconut tree having been called Kalpa Vriksha, literally the tree that supplies all that is needed to live. “According to Ayurveda, coconut oil has pitta pacifying or cooling properties. Changes in heat and temperature create a disturbance in pitta dosha, which is associated with the fire element, and causing a sensitive skin syndrome (in which the skin is easily irritated and inflamed with diffused redness). Eczema, acne, and rosacea are other examples of pitta imbalance,” says Dr. Neena Chopra, co-founder and director beauty and technical, Just Herbs. She explains, “The main component that sets it apart from other oils is the presence of lauric acid. Other than mother’s milk, the highest concentration of lauric acid is found in virgin coconut oil. Lauric acid, the predominant medium-chain fatty acid found in coconut oil, has proven antibacterial, antiviral, antifungal, and anti-inflammatory benefits.” It can be used as a body and face moisturizer, particularly in the summers for its cooling effects and SPF properties. The way the oil is extracted from coconut determines how much nutrients it holds within its folds. Refined coconut oil is one that has been extracted from previously dried coconut meat with chemical solvents or through physical extraction methods. In this method, some of the beneficial nutrients are lost. On the other hand, cold-pressed oils are extracted by boiling, fermentation, refrigeration, mechanical press and centrifugation. Since high temperatures and chemicals are not used, cold-pressed oil retains all its phytochemicals (chemicals derived from plants), along with the distinctive taste and smell. This is the purest form of coconut oil with water white color and contains natural vitamin E. This is not an official classification but simply suggests that the oil has been subjected to less intense refining, lower temperature, and no chemicals. Here’s why it makes the most amazing multi-tasker in your vanity dresser. Dip cotton pads in coconut oil and press softly over eyes and lips before wiping off the make-up. Coconut oil gently dissolves long lasting, highly pigmented make-up without drying the skin. In one single step, the skin is deeply cleansed as well as moisturized. And as a bonus, the anti-bacterial action of lauric acid keeps the microbes at bay. Coconut oil is great for luxurious pre-bath massages and quick post-bath hydration. It melts on the skin as soon as you apply it, seeps into the pores and hydrates deeply. It can also be used to treat an array of skin problems such as psoriasis, dermatitis, eczema and dry-flaky skin. Coconut oil also helps in wound healing and is considered a home remedy to treat minor cuts, scrapes, and abrasions. Its anti-fungal properties prevent and treat foot fungus. Because coconut oil improves collagen cross-linking and can restore lipid barrier function, it is considered be an effective treatment for stretch marks. It’s one of the safest oils recommended for massages in the case of pregnant women. Worried about damaged hair? Again coconut oil is the solution. Because of its molecular weight and shape, coconut oil is able to penetrate deep into the hair, and repair damaged hair. Lauric acid has a high affinity for hair proteins and being of a low molecular weight and a straight linear, it is able to penetrate inside the hair shaft. Regular use of coconut oil leads to lustrous hair as its lubricating effect reduces fiber friction. Its antimicrobial properties improve dandruff and dry scalp conditions. Applying it to the head, followed by a gentle massage, also helps eliminate mental fatigue. To purify oily skin, apply lukewarm coconut oil generously on the face and neck after cleansing it. Leave it on for 10 minutes and wash with warm water. It will balance sebum secretion, without the unflattering peel-off effect of drying anti-acne medicated creams. A breakdown of collagen through UV rays, pollution, and hormonal imbalances is responsible for sagging and dull skin. It is now documented that the triglycerides in the oil attract protein molecules, ensuring timely repair of the collagen layer. So you can consider anti-aging formulations that use coconut oil, or use the oil as it is to improve skin’s elasticity. Nothing works on chapped lips better than a soft rub of coconut oil. For best results mix a teaspoon of sugar in some cold-pressed coconut oil and make yourself an easy DIY lip scrub. Dead skin is exfoliated, and the lip color also brightens with regular use. Essential oils are therapeutic, but because of their potency, most cannot be applied directly to the skin. Often they need to be diluted with some carrier oils to improve their efficacy and absorption into the skin. Carrier oils are those which easily penetrate into the skin. Coconut is one of the most stable oils that doesn’t go rancid. It is often used Ayurveda formulations, as it does not alter the properties of the oils and herbs mixed with it. Rather it protects the herbs and other essential oils from microbial or fungal interactions. To intensify the effect and elevate your bathing experience, mix some sea salt and coconut oil and use this as a scrub on the body (not face) in circular motions. Wash off within 5 minutes. This also reduces the presence of cellulite. Lauric acid in coconut oil provides safe nourishment to an infant’s skin. It is found very effective in treating cradle cap which is characterized by a flaky scalp. The hydrating qualities of coconut oil lend relief from dry skin conditions such as eczema in new-borns and soothe diaper rash. In Ayurveda, coconut oil is considered one of the best ways to remove bacteria and promote healthy teeth and gums. Known as Gandusha, it is a fantastic oral detoxification procedure that’s simply done by swishing a tablespoon of pure coconut oil in your mouth for 10- 20 minutes. Mere hair pehle long the. After delivery short ho gye. Hairs k root close ho gye h. Ye helpful h oil for hair growth.